Our Commercial Wood Fired Ovens have been designed to come to temperature very quickly, giving an even cooking temperature and have a good residual heat. They come in 3 sizes and can be used in a variety of circumstances - from busy take-away venues to fine dining. The Dingley Dell Wood Burning Oven is the perfect Oven for our English climate and offers unmatched performance and reliability. Our Ovens can be used as they are, or they can be built into an insulated housing of your own design to give enhanced performance. Our Ovens have been installed in Restaurants, Pub Gardens, Beach Cafes, Take Away Venues and in Mobile Catering Units. We also have exported our ovens all over the world. For example.... Japan, Russia, Malta, Norway, Ireland, America, France to name but a few. We have put together a FREE QUICK GUIDE to installing an oven in your Resturant, Pub, Pub Garden, or Take Away. Simply fill in the information for IMEDDIATE ACCESS. When we started making our ovens 10 years ago, we only did a domestic range for outdoor use in garden kitchens. 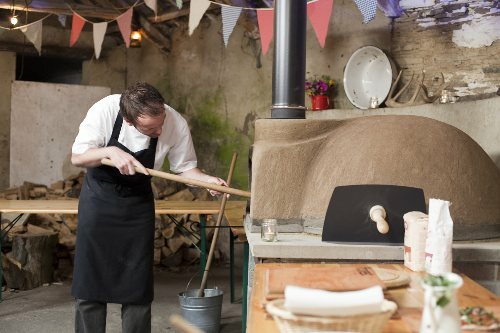 We were way ahead of our time and it wasn't until celebrity chefs like Jamie Oliver and Hugh Finley-Whittingstall, started promoting the use of wood fired ovens, did our many years of development start reaping its rewards. When comparing prices of our ovens against the "Big Boys" you will find that we compare very favorably in price. This is not because our products are inferior. In fact we would go as far as to say that the ovens that we make are superior in construction and serviceability. Whilst our competitors are mearly dabbling with high-heat fibre reinforcing, we have taken it to the extreme! Just look at our dome home and you will quickly realised that we know what we are talking about. Our ovens are designed for the English weather while most of our competitors are importing ovens designed for hot mediterranean climates - there is a huge difference! If you have any specific questions please do not hesitate to call us. All of our Ovens are sold on a supply only self-install basis. Ovens that are built into buildings and kitchens will need to comply with building regulations and the flue will need to be installed by a competent HETAS registered Engineer. In most cases where ovens are installed in restaurants and commercial kitchens the flue will need to be fitted with a balanced flue fan to ensure that the any smoke is effectively exhausted from the building. The cost of flue is not quoted with the oven as all installations vary. If you need any help on installation conforming with building regulations or finish design please do not hesitate to call us we will be happy to advise. Your first decision is what you want the final finished Oven to look like and where you want it to go. The Dome and Floor of the oven (also available from Dingley Dell) are but the first step in a chain of events that will need to happen in this decision process. Every customer has a completely different idea of what an oven should look like when its finished. The important thing to remember is that every single wood burning oven has a dome built into it. We have been hand making these out of the highest grade of refractory (very high heat industrial fire cement) that we can find. Our Oven Domes and Oven Floors have been designed to have the correct size opening for the flue diameter and the correct amount of height of the dome, to ensure that the oven is able to maintain a reliably constant temperature with a minimum fire size. Deciding on what you want the oven to look like when finished will also have a huge baring on the final cost of the investment. For instance, if you want the final oven to have an insulated brick effect dome shape this will cost so much more and is a lot more challenging than if you want to finish the oven in an insulated box housing with a pent or piched roof. The performance of the oven in both instances will be exactly the same but the cost vastly different. Once you have decided on your final look you will need to contact a HETAS Engineer to quote on that part of the job. In many cases you will also need to obtain planning permission and advise your local Environmental Health Authority. We can help you with guidance on this process. If you have difficulty finding a HETAS engineer then we can recommend one who will be able to give rough costings based on a telephone conversation if you wish to proceed they charge a site consultation fee which is refunded if they do the installation. Your local builder will be able to quote on the actual install of the oven as this does not require any huge amount of skill and we will be happy to advise them on steps that need to be taken. Below you will find the links to the Technical Drawings for the Commercial Garden Oven Range. Please note that all of our Commercial Ovens have a 7" Flue Connection. I am often asked if it's possible to install a gas burner into one of our Ovens to give the option of changing to gas when the oven is ticking over. This is something that was seriously looked at since the day I started making ovens. However it is just not possible for a small company like ours to achieve at the moment. Whilst we know it works and have run trials with burners at our Factory, the current UK Legislation for the Testing and Supply of Ovens is so extensive it is not currently viable for us to persue. I would also advise you to be wary of companies offering to sell you ovens that are capable of doing both or that say they have a conversion kit available. Make sure you ask for a copy of the Certification for 'Use as a Gas Appliance'. Our opinion is that in most cases there will be some excuse as to why it can not be supplied. The Gas Compliance Legislation and Requirements are just to expensive for small operators to absorb. There are some ovens out there that have the certification but be prepared to pay a lot for a dual purpose oven as the oven will have to have passed both smoke control and gas control regulations and requirments. One last note on this, whilst an oven may work on an illegaly supplied gas burner, it's when it goes wrong that you really need to worry. The confined space of an oven is just the perfect environment for an explosive atmosphere and you the employer will be held responsible for the welfare of your staff should they get hurt, not the person that sold you the conversion kit. In any case if you are going to go to gas you might want to consider a Conveyor Oven since you will be missing the whole point of having a wood oven! Authentic flavour and a crispy stone baked base. Stick to wood ovens! Once you know what you are doing you it's so exciting, quick and easy to use. If your Business is going to be in a city or town centre then it is possible that you probably fall under the smoke control legislation. If yo do not yo may find that the building inspector or environmental health inspector will insist that you only install an oven that is exempt. It has taken me more than 18 months and quite literally tens of thousands of pounds to get clarification on how the law may apply to wood burning Pizza ovens. The clean air act says in brief that it is an offence to emit smoke from the chimney of a building or to use an un licenced fuel in an un exempt appliance. Early discussions with defra excluded wood burning pizza ovens in the garden as it was felt that wood burning ovens would fall under the same legislation as a bbq or a chimenea and as a result you could only be prosecuted for creating a nusciance to your neighbours ie smoking them out. commercial premises however are not exempt of this rule. When you buy an oven from us you are buying more than 11 years of dedication and development our ovens are not expensive they are a high quality product that has stood the test of time in through the vagaries of our very unique English weather. Cafe Eno resturant in dundalk opened on 27th March 2011 follow their progress and rave revies on this face book page. 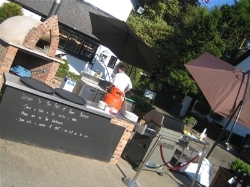 The Bells of Peover in Knutsford installed their oven in March 2010 and serve fantastic food into the beer garden directly from the oven check it out . A trendy new wine bar music venue in the heart of Bristol has just opened in March 2011 the fresh pizza comes straight out of the oven to your table this is what mark wolf the owner has to say . "Remember when you buy a Dingly Dell Pizza oven. You are buying a handmade oven made with passion and love. Once they leave the farm. Jay gives them all a name. Please be warned that once they leave him, he will check up on them. He will want to make sure you are running it in correctly, and you return the same love and devotion to the oven, as he has given to them when they are built. Just be warned if he finds out if you are not using it correctly he will visit you, help you, make food with you, and inspire you. If you still fail in getting the same reward out of the oven that is loyal followers have. He will Asbo you, he will not allow you out after dark, until you learned that this wood burning oven, is pure heaven to work with". The Galleon Beach cafe Polzeath Cornwall . 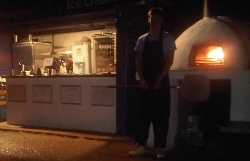 This is a hot spot for surfer and sea loving folks the Stunning beach has a sea wall and on top of that wall is the wood fired oven that we delivered in april 2010 this oven runs all day serving fantastic pizza directly onto the beach then in the evening chill out on the beach wall with a pizza and a glass of wine . This is what Alan Coby has to say. "After only 5 Weeks, This week my weekly revenue from Pizzas from my Dingley Dell Wood Fired Oven exceeded the TOTAL Cost of the Oven and Total Installation Costs. It also generated higher revenues than from "Booze" We are now selling in excess of 60+ Pizzas per day (and increasing) with a GP in excess of 80%"
I could not recommend a product more highly both in use and for "Bang for the BUCK"
Alan went further to say that they had exceeded the 110 mark cooking 4-5 pizza at a time in our large commercial oven . The Bushcraft company has 4 wood burning ovens . 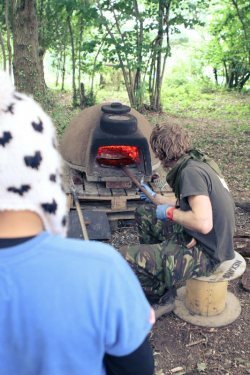 In the summer of 2010 The Bushcraft company got one of our medium ovens which has been set up in the forrest ,it has been so successful that they now have 4 of them, the ovens form the cornerstone of many of the cooking experiences in and around the woods. This year they want something new and exciting so Edd and Tom called me. Could I get a Large Oven made for them within a week so that they could install it in time and cook pizza for the Royal wedding in the beer garden , all that and a the easter holiday between . Working around the clock and into easter friday we delivered our promise ,The oven was made and Tom and Edd hired a transit truck and drove up to the factory to pick up the new oven. I cant wait to see the pictures of fresh cooked nepolitana pizza wedding Food that the royal party no doubt would be proud to have at their special day. Good luck . keep us posted . Cheers Jay & the team.